STILL AT IT: As noted a few weeks ago, Rick Brannan is tweeting his way through Old Testament Pseudepigrapha: More Noncanonical Scriptures, Volume 1, text by text. He collects all of these tweets to date on his blog here, with one more posted since: "Apocryphon of Ezekiel: Lots of folks through history attribute Bibleish Ezekiely-type stuff to Ezekiel. Here it is, collected." This puts him a little over halfway through the volume in pages and also in texts - the latter if he puts up individual posts for the texts translated by Helen Spurling in the last chapter, "Hebrew Visions of Hell and Paradise." LAST WEEK'S DAF YOMI COLUMN BY ADAM KIRSCH IN TABLET: In the Talmud, the Fall of a Priestly Upper Class Is Just Deserts. Biblical examples of righteousness and wickedness show that in Judaism, goodness remains possible and divine. This anecdote suggests, though obliquely, what an enormous upheaval the destruction of the Temple must have created in Judean society. The priestly hierarchy was large and well-established, constituting the upper class of the nation; now they were suddenly rendered useless, like aristocratic émigrés during the French Revolution. There is even a hint of satisfaction in Yishmael’s words. The Talmud makes no secret of the fact that the priests’ ostentation and hunger for prestige sometimes made them unpopular. The fall of the House of Avtinas must have looked to some people like their just deserts. HAARETZ has a couple of recent articles on clothing and its coloring in ancient Israel. First: Pink wool to ponchos: What people in ancient Israel really wore. The man in the dusty street wore a tunic and sandals. The rich could dress so splendidly that they risked being struck down by divine anger (Miriam Feinberg Vamosh). The wealthy could afford to expand the repertoire of colors in their closet from the earthy tones of the original sheep and goat coats to a rainbow of raiment. The most costly dye was purple manufactured from the murex snail. But imitation purple for clothing could come from the hyacinth flower, for example. Textiles discovered at Masada included cream, pink and purple, and other colors mentioned in Roman sources include gold, walnut and yellow, all of which came from plants. Scarlet dye came from an insect, the kermes vermilio. Second: Rare find || Fragment containing ancient 'tekhelet' dye discovered near Dead Sea. The precious blue dye, derived from snail glands, was used in ancient times to color the tassels of the four-cornered garment worn by men; this is only the third time such fabric has been found (Judy Maltz). Announcing the discovery, Dr. Na'ama Sukenik, a curator at the Israel Antiquities Authority, said the tiny piece of fabric had been discovered in the 1950s in a cave at Wadi Murba’at, where Jewish fighters hid during the Bar Kokhba revolt in the second century. As part of her doctoral dissertation at Bar Ilan University, Sukenik recently tested the color found in the fabric and was able to determine that it was derived from the Murex trunchular, a mollusk widely believed to be the marine animal known as the khilazon in the Talmud -- the source of the rare blue dye. More on the ancient tekhelet dye here and links. Also, lots more on ancient bling (mentioned in the first article) here and links and (sort of) here. TEMPLE MOUNT WATCH: That classified 2010 Israeli State Comptroller's Report on the Waqf's unauthorized excavations on the Temple Mount has reportedly been leaked to The Jewish Voice, which has published the Hebrew original and also an English translation. So far the Israeli Government has declined to comment on its authenticity. The Jerusalem Post summarizes the summary in Classified comptroller report on Temple Mount slams government for failing to protect area from Wakf. ANDREW PERRIN: The Dynamics of Dream-Vision Discourse in the Aramaic Dead Sea Scrolls (ASOR Blog). In my McMaster University doctoral dissertation, “The Dynamics of Dream-Vision Discourse in the Aramaic Dead Sea Scrolls,” I explore the form and function of revelatory dream-vision accounts that are interspersed throughout approximately twenty of these texts. Dominic Selwood's new thriller The Sword of Moses features the Templars, Montsaunès and a number of the themes discussed in this article. My reviews of The Da Vinci Code novel and film are here and here. My visit to Rosslyn Chapel is described here. The Sword of Moses is also the title of a late-antique magical treatise in Hebrew and Aramaic. It has recently been translated into English by Yuval Harari and his translation is also forthcoming in volume 2 of the More Old Testament Pseudepigrapha Project. STEPHEN C. CARLSON: Uppsala Post-Doc in Hebrew Bible. Knowledge of Swedish is desirable. The application deadline is 15 January. OLD TESTAMENT PSEUDEPIGRAPHA WATCH: Zosime (Réchabites) is a project on The Story of Zosimus/The History of the Rechabites at the Catholic University of Leuven headed by Prof. Jean-Claude Haelewyck. It includes French translations of the Greek text and two Syriac versions. I have a couple of relevant conference papers from 2003 online: The Rechabites in Patristic and Parabiblical Literature and Is the Story of Zosimus Really a Jewish Composition? DR. JACOB L. WRIGHT: The Birth of Moses: Between Bible and Midrash: A Supplementary Approach (TheTorah.com). What we witness in this brief study is the extent to which rabbinic tradition stands in direct continuity to the formation of the biblical text. The earliest biblical account of Moses’s birth responds to questions about his origins. A later preface responds to the problems posed by the older account, and both texts in turn provoked new attempts by the rabbis to solve the remaining problems in the text. In this way we can trace how the multilayered pearls of our tradition evolved from the agitating sands of time. ALREADY?! CALL FOR PAPERS: SBL 2014 ANNUAL MEETING IN SAN DIEGO, CA. Posts of Christmases past are collected here and links. Many consider the gospel of Matthew to be one of the most "Jewish" texts of the New Testament. Luke-Acts, on the other hand, has traditionally been viewed as a very "Greek" and Gentile-Christian text. Isaac W. Oliver challenges this dichotomy, reading Matthew and Luke-Acts not only against their Jewish "background" but as early Jewish literature. He explores the question of Torah praxis, especially its ritual aspects, in each writing. By assessing their attitude toward three central markers of Jewish identity - Sabbath, kashrut, and circumcision - Oliver argues that both Matthew and Luke affirm the perpetuation of Torah observance within the Jesus movement, albeit by differentiating which Mosaic commandments are incumbent upon Jewish and Gentile followers of Jesus. Luke proves to be just as "Jewish" as his cousin Matthew in so far as his affirmation of the Mosaic Torah is concerned. The evidence in both Matthew and Luke-Acts suggests that Jewish practices such as the Sabbath and even circumcision continued to enjoy a prominent status in the Jesus movement even after 70 CE, and that Jewish followers of Jesus played an important and integral role in the formation of the ekklesia well throughout the latter third of the first century CE. 2. Juan C. Ossandón reviews Corrado Martone, Lettere di Bar Kokhba. The two books have also been noted here and here. This book is a study of related passages found in the Arabic Qur’an and the Aramaic Gospels, i.e. the Gospels preserved in the Syriac and Christian Palestinian Aramaic dialects. It builds upon the work of traditional Muslim scholars, including al-Biqa‘i (d. ca. 808/1460) and al-Suyu?i (d. 911/1505), who wrote books examining connections between the Qur’an on the one hand, and Biblical passages and Aramaic terminology on the other, as well as modern western scholars, including Sidney Griffith who argue that pre-Islamic Arabs accessed the Bible in Aramaic. THE TALMUD BLOG: A Review of Weiss Halivni, The Formation of the Babylonian Talmud- Guest Post by Zvi Septimus. NOT QUITE AS EXOTIC AS SYRO-GEORGIAN BUT STILL COOL: The first discovery of Judaeo-Syriac: T-S K14.22. The Cairo Geniza is the philologist's gift that keeps on giving. SUCCESS: Oxford and Cambridge universities buy Lewis-Gibson Genizah collection. A fundraising appeal by Oxford and Cambridge universities to buy a collection of 1,000-year-old Hebrew and Arabic manuscripts has been successful (BBC). To the tune of £1.2 million. Not bad. Earlier posts on the fundraising effort are here and here. JARED CALAWAY: Reminiscing on Alan Segal. Some past posts on Alan Segal are here, here, and links. THIS WEEK'S DAF YOMI COLUMN BY ADAM KIRSCH IN TABLET: What the Talmud Would Say About the Pew Survey of American Jews: Stop Counting. An ancient principle of Judaism, debated at length in the Oral Law, is that it is a sin to count Jews—or is it?. It doesn’t take any particular news event to make Jews start worrying about the future of Judaism. But this fall, the release of the Pew survey “A Portrait of Jewish Americans,” with its findings about high rates of assimilation and intermarriage, added some fuel to the fire. As community leaders debated what to do about the problem—if it is, in fact, a problem—one suggestion was conspicuous by its absence: No one proposed that we simply stop doing censuses of Jews. Yet this would be the most Jewish solution of all, since an ancient principle of Judaism is that it is a sin to count Jews. God says as much in Exodus 30, when he instructs Moses that if he counts the Israelites directly, a plague will fall on them. Instead, the census is to be taken indirectly: Each adult over the age of 20 is to contribute a half-shekel coin, and then the coins are to be counted. This precaution is ignored by King David, in II Samuel 24, when he impetuously conducts a census of his kingdom; and as promised, he is punished by God with three days of pestilence. Wevers's LXX-notes volumes - free! WORDS ON THE WORD: John William Wevers LXX Text Histories… free .pdf downloads. For you, special deal! These five volumes are invaluable resources for working with the Greek text of the Pentateuch. Rabbinic/Medieval Judaic Studies: The Judaic Studies Program at Franklin & Marshall College invites applications for a Visiting Assistant Professor, beginning Fall 2014, pending final administrative approval. The position is in premodern Judaism with possible subfields in rabbinics, medieval philosophy, or Kabbalah. It is renewable for up to three years on evidence of good teaching and administrative approval. Appointment will be at the instructor or assistant professor level depending on qualifications; teaching experience highly desirable. The successful candidate will teach introductory courses in Hebrew Bible and Classical Jewish Texts as well as upper-level courses in his/her specialty; the teaching load is 3/2. Candidates should submit the following materials as PDF files (searchable preferred) to Tami.Lantz@fandm.edu: letter of application, curriculum vitae, graduate transcript, three letters of recommendation, and teaching evaluations. UPDATE: Please refer to the revised information on this position, now posted here. Do any of these infelicities matter? Yes and no. Yes, they matter if you want a historical description of these ancient texts and their authors in context. No, they don’t if you want to know the particular ingredients of the West’s tradition of anti-Judaism. That latter project is the heart of this haunting book. Read it. You will find yourself, again and again, wishing that you could reach your hand back in time, catch these toxic themes at their launch, and prevent all the deaths that you know will surely follow. An earlier review and an essay by Nirenberg are noted here. REMINDER: St Andrews Symposium for Biblical and Early Christian Studies: Ancient Readers & Their Scriptures: The Texts, Reading Strategies, and the Versions of the Hebrew Bible in Second Temple and Early Judaism. The call for papers is now open, with a deadline of 1 February 2014. Follow the link for more information. Noted earlier as well here. You can find information on some past symposia here, here, here, and here. BIBLE HISTORY DAILY: Bible Secrets Revealed, Episode 1: “Lost in Translation.” Robert Cargill responds to viewers’ questions on the History Channel series (Robin Ngo). We are pleased to announce the launch of the new website, www.bensira.org. The diverse ancient (Qumran, Masada) and medieval (Cairo Genizah) manuscripts of the book of Ben Sira are currently housed in libraries and institutions (and in one instance a private collection) in Cambridge, Oxford, London, Paris, New York, Los Angeles, and Jerusalem. This website brings together for the first time the entirety of the manuscript tradition (even if the Bodleian Library folios of MS B are not available at our website at this time), in a convenient user-friendly format. At this point we have launched only the first stage of the website, with high-resolution digital images of the documents. Future updates will include transcriptions, translations, and resources. The developers of the website gratefully acknowledge the assistance and cooperation of the custodians of the various Ben Sira documents, all of whom are acknowledged at the Introduction page of the website. Rutgers University, New Brunswick, N.J., U.S.A.
Brannan on MOTP1, plus electronic edition! 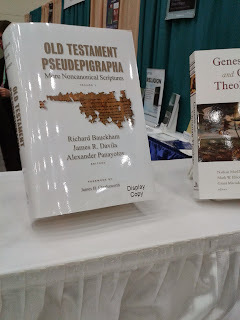 RICK BRANNAN: Received: Old Testament Pseudepigrapha: More Noncanonical Scriptures by Bauckham/Davila/Panayotov. His review is coming in due course. Meanwhile, he is posting a tweet (#MoreOTP) on each chapter as he reads it. By the way, I have posted a TC of volume one here. Rick also notes on Facebook that an electronic edition of the volume is available with Logos Bible Software, which is (good) news to me. YES, IT'S THAT DAY AGAIN. More here and here and links. Also, lots more on time travel here, here, here, here, and links. UPDATE: James McGrath comments, apparently yesterday. TONY BURKE: 2013 SBL Annual Meeting Diary. My own report on the 2013 SBL conference is here. Imagine that you wanted to build an exact duplicate of your house, and you hired an architect to do the job. But the architect isn’t allowed to see the building she was supposed to duplicate, and you aren’t allowed to make any blueprints or drawings of it: All you can do is describe its dimensions in words. Something like this is the challenge facing the rabbis when they try to imagine the Holy Temple, which stood in Jerusalem for centuries before the Romans destroyed it in 70 C.E. The Amoraim had never seen the structure they were trying to describe. All they had were conflicting reports from a variety of rabbinic sources, which had to be reconciled with each other and with the biblical description of the Temple. It’s no wonder, then, that the accounts of the Temple in Tractate Yoma, which Daf Yomi readers have been exploring this week, are so inconsistent and hard to follow. Previous Daf Yomi columns are noted here and links. UPDATE (8 December): Bad link now fixed. Sorry! IT'S MARK GOODACRE'S TURN TO ASK: Whatever happened to the Gospel of Jesus' Wife? And he asks another excellent question at the end of the post. UPDATE: More from Larry Hurtado: “Jesus’ Wife” Fragment: A Continuing Puzzle. EERDMANS BLOG: “Revealing Christianity’s Secret Scriptures” by Tony Burke. 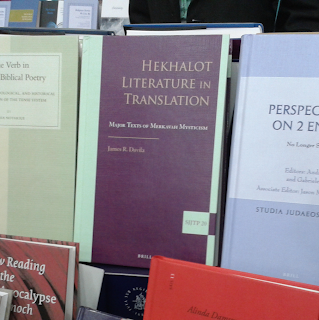 NIJAY K. GUPTA: Make Shelf-Space for More “Old Testament Pseudepigrapha”! Indeed. SYRIAC WATCH: The University of Birmingham's Mingana Collection website includes some interesting Syriac manuscripts, as well as manuscripts in Arabic and Greek. (HT Emmanouela Grypeou on Facebook.) More on the Mingana collection here and link. The works to be digitised include the small but staggering collection of Greek manuscripts in the Vatican, including ancient texts of works by Homer, Sophocles, Plato and Hippocrates. The Bodleian's collection is much larger – by the end of the 17th century the most important in Britain – but later, mainly of 15th and 16th century manuscripts. The Vatican's Hebrew texts include the oldest Hebrew codex – a manuscript bound as a book – in existence, and a copy of the entire Bible written in Italy around 1100. The Vatican's collection of 8,900 incunabula – the earliest printed books, many published in Rome – is the fourth largest in the world, followed closely by the Bodleian's. The project website is here. Note also its Hebrew Manuscripts page, the essay thereon by renowned Hebrew codicologist Malachi Beit-Arié, and the essay by Nigel Wilson on the Greek manuscripts. Background here, with lots of links about other digitization projects. TEMPLE MOUNT WATCH: The most contested real estate on Earth? In the Washington Post Richard Johnson, Gene Thorp, and Bonnie Berkowitz have an interesting and useful graphic about the history of the site. [Robert] Deutsch filed suit on 28 November in the Tel Aviv District Court against the Israel Antiquities Authority, its director Shuka Dorfman, the head of its anti-theft unit Amir Ganor, the Jerusalem District Attorney and Assistant District Attorney Dan Bahat who led the prosecution. He is seeking 12 million shekels ($3.4 million) in damages – an astronomical sum for Israel. In an interview, Deutsch said the multi-million-dollar damages demanded were “a drop in the ocean” compared to the wreckage wrought to his reputation and business by the affair. Deutsch was never accused of any involvement with the alleged forgery of either the James Ossuary or Jehoash Tablet, but when those items propelled the sprawling, 18-count indictment sheet into the headlines, as the main co-defendant his name was yoked to the allegations against Golan. Background on the Israel forgery trial and its aftermath is here with many links. The discoverer of the Iraqi Jewish archive weighs in: Scholar fights to keep Jewish artifacts from returning to Iraq. Harold Rhode's elation at finding the trove during the Iraq war has since turned to outrage that the salvaged texts might go back. (David S. Cloud, L.A. Times). WASHINGTON — Harold Rhode still recalls the euphoria he felt a decade ago after finding thousands of dripping, moldy artifacts of Iraq's once-vibrant Jewish community in the flooded basement of Saddam Hussein's intelligence service headquarters in Baghdad. "How do you describe it? An enormous elation, a deep connection, but also shock: Why would this be here?" says the 64-year-old former Pentagon official, an Orthodox Jew who discovered the purloined archive in the bombed-out building days after he arrived in the Iraqi capital with the U.S. invasion force in the spring of 2003. People who saw him at the time recall that Rhode, a disheveled, rotund scholar of Islamic history, was nearly overcome with emotion as he rescued the waterlogged books, personal papers and sacred texts, including a 400-year-old Hebrew Bible, all of which seemed to be a link to the ancient — and mostly dispersed — Jewish population of Mesopotamia. But like the arc of the U.S.-led war in Iraq, Rhode's involvement with the Iraqi Jewish archives has progressed from exhilaration to disillusionment and recrimination. Since he arranged 10 years ago for the collection to be brought to the United States in metal shipping containers, on which he had scrawled "RHODE" and "TORAHS" in big letters, the books and documents have been carefully cleaned of mold and grime, preserved and digitally photographed by experts at the U.S. National Archives. When summer comes, however, they are to be returned to the Iraqi government, an ending that Rhode likens to giving the personal effects of Jews killed in the Holocaust back to Germany. At a hearing last month before the House Foreign Affairs Committee, lawmakers grilled Brett H. McGurk, deputy assistant secretary of State. He affirmed that the U.S. was committed to the "safe and rightful return of these artifacts" but also acknowledged that "we have heard loudly and clearly the concerns" of the Jewish community. "We'll see what we can do." I mentioned Harold Rhode in connection with the archive here back in 2004. Cynthia Kaplan Shamash, from the New York-based World Organisation of Jews from Iraq, said Iraqi Jews were grateful for the restoration but did not want the archive to go back. "Returning the collection to a Jewish-free Iraq in the current conditions is incomprehensible and unacceptable," she said. Finding her old report card in an archive that houses the Declaration of Independence was “kind of cool” for Dr. Bassoon-Zaltzman. But mostly it wasn’t cool. Mostly it made her angry, and sad, and brought back a tide of bad memories from her childhood, from the Iraq of the 1960s where a once vital Iraqi Jewish community lived in fear, never knowing who would be arrested next. “I really felt violated seeing my report card because I knew the Iraqi secret police had no way of getting it unless they took it from our house,” Dr. Bassoon-Zaltzman says. “All I could think about was somebody being in the house I grew up in and stealing this document and storing it in the basement of the Mukhabarat — the secret police of Saddam Hussein. “Sending these items back to Iraq now would be like sending art that the Nazis looted from Europe’s Jews back to Germany. But it’s even worse, because I am nobody. I am not famous, and I am still alive, and there is no inherent value to these items. Nobody in Iraq is going to care about looking at documents and photos of Iraqi Jews that they don’t even know and that have no value to them, or the Iraqi government, or anyone — except the people they were stolen from. PUNIC WATCH: History Developing Hannibal Miniseries Executive Produced by Halle Berry (comingsoon.net). History is developing the miniseries "Hannibal" (working title), co-produced by A+E Studios and Red Arrow Entertainment with Academy Award-winning Actress Halle Berry executive producing and Oscar-nominated writer Jeffrey Caine (The Constant Gardener, GoldenEye) penning the script, it was announced today by Dirk Hoogstra, Executive Vice President and General Manager, History & H2. The miniseries will tell the story of the greatest generals in antiquity - Hannibal Barca and his archrival Scipio Africanus - who went head-to-head in the Second Punic War. This is evidently unrelated to Vin Diesel's longstanding project of a Hannibal movie. I have many other past posts on Hannibal, e.g., here, here, here, here, and here. Timothy Lim’s new book The Formation of the Jewish Canon does not seek to provide a comprehensive treatment of canon formation but rather attempts to address select questions with some depth. He thus gives little attention to what we can learn of the Jewish Bible from patristic sources, which scholars such as Gilles Dorival have shown to be valuable for this task. Nevertheless, each of the debatable points listed above receives treatment here. Lim concentrates on the pre-rabbinic sources that illuminate (however faintly) the process by which the main contours of the Jewish canon were established during the period from Ezra in the fifth century BCE to the destruction of the Second Temple in 70 CE. The book was noted earlier as forthcoming here. The relationships between Pauline literature and the Dead Sea scrolls have fascinated specialists ever since the latter were first discovered. Now that all the Qumran scrolls have been published, it is possible to see more clearly the amplitude and impact of this corpus on first century Judaism. This book offers some syntheses of the results obtained in the last decades, and also opens up new perspectives, by highlighting similarities and indicating possible relationships between these various writings within Mediterranean Judaism. In addition, the authors wish to show how certain traditions spread, evolve and are reconfigured in ancient Judaism as they meet new religious, cultural and social challenges. Fish or dish on the Talpiot Tomb B inscription? MARK GOODACRE (Wim G. Meijer): If it walks like a duck: Ossuary 6 of the Talpiot 'Patio' Tomb depicts commonly used Jewish images. Numerous earlier posts on the Talpiot Tomb B inscription are here and links. The two Jewish works that are the subject of this volume, 4 Ezra and 2 Baruch, were written around the turn of the first century CE in the aftermath of the Roman destruction of the Second Temple. Both texts are apocalypses, and both occupy an important place in early Jewish literature and thought: they were composed right after the Second Temple period, as Rabbinic Judaism and early Christianity began to emerge. The twenty essays in this volume were first presented and discussed at the Sixth Enoch Seminar at the Villa Cagnola at Gazzada, near Milan, Italy, on June 26-30, 2011. Together they reflect the lively debate about 4 Ezra and 2 Baruch among the most distinguished specialists in the field. More on the Sixth Enoch Seminar here, here, and here. A proper assessment of the manifold relationships that obtain between “wisdom” and “Torah” in the Second Temple Period has fascinated generations of interpreters. The essays of the present collection seek to understand this key relationship by focusing attention on specific instances of the reception of “Torah” in Wisdom literature and the shaping of Torah by wisdom. Taking the concepts of wisdom and torah in the various literary strata of the book of Deuteronomy as a point of departure, the remainder of the book examines the relationship between wisdom and Torah in Wisdom literature of the Second Temple period, including Proverbs, Qohelet, Ps 19 and 119, Baruch, Ben Sira, Wisdom, sapiential and rewritten scriptural texts from Qumran, and the Wisdom of Solomon. ASKING THE IMPORTANT QUESTIONS: Seriously? Jack Collins: "Scholars have suggested a number of factors that led to Enoch's rejection from most Christian biblical canons ..."
THIS WEEK'S DAF YOMI COLUMN BY ADAM KIRSCH IN TABLET: The Talmud Says God Can’t Protect Jews From Persecution; They Must Take Precautions. A ‘mezuzah,’ like Judaism, is designed for life in this world, not for a messianic future, or for martyrdom. This week’s Daf Yomi reading gave striking examples of such Talmudic difficulties. Say, for instance, that you wanted to know whether a certain building or doorway required a mezuzah. We know that the door of every residence is supposed to have one. But what about a public building, like a synagogue? What about a building that gets filthy, like a barn or a bathhouse, or a temporary structure, like a sukkah? What if two people own a house in partnership—do they both have to put up a mezuzah? And what about unusual entryways, like a tall arch—do they qualify? These are the kinds of minutely detailed questions you would expect the Talmud to ask, since it is always concerned with anticipating the full range of possible questions, no matter how unlikely. What you would not expect is that the answers to those mezuzah-related questions would be found in Tractate Yoma, which is supposed to be about Yom Kippur. 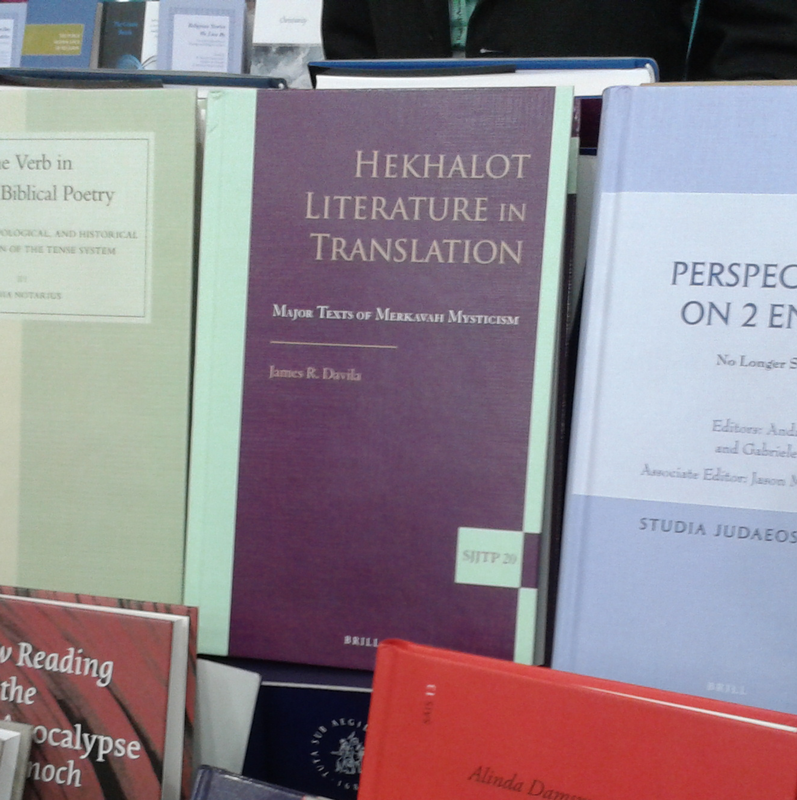 My translation of the Hekhalot literature is to be reviewed at the 2014 SBL in San Diego in the Esotericism and Mysticism in Antiquity Section. 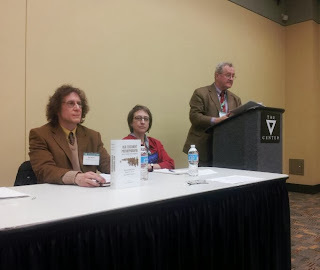 L to R: Jim Davila, Judith Newman, John J. Collins. Photo courtesy of Sarah Whittle. As I said, I was pleased with this year's review of Old Testament Pseudepigrapha: More Noncanonical Scriptures, Volume One (photo above). There were people coming and going throughout the session and at peak attendance I counted about 60 in the room. I recall that there was an SBL review session on Charlesworth's two Old Testament Pseudepigrapha volumes back in 1986 or 1987. It took place around a single large table in a room and my recollection is that there weren't more than about 20 people present, which perhaps reflects something of the expansion of interest in the field since the mid-80s. One of the reviewers, Liv Ingeborg Lied, has posted her review on her blog: Text – work – manuscript: what is “an Old Testament Pseudepigraphon”? In return, I am posting my response to her review below, along with the opening and closing paragraphs of my whole response. Liv Ingeborg Lied Liv raises some legitimate methodological concerns over the fact that we treat a large number of alleged quotations of now otherwise lost works ("conceived compositional units") as representative of actual lost works and that sometimes we even infer the existence of lost works from passages in the work of a later author which imply or hint at the use of an earlier source. This would be her third category, "entries that represent as works texts-on-page that are conceptualized in a rather different way in the manuscripts themselves." She asks specifically about the text fragment attributed to a Book of Noah, but implicitly about a number of other texts translated in the volume, "[I]s the textual entity described here a work at all, and if it is; what work are we talking about and to whom is this a work?" The editors were of the view, as we said in the introduction, that the quotation fragments included in this volume and the forthcoming one could at least be argued to come out of earlier, otherwise lost "works" and that it was worthwhile to present the case for each so scholars could evaluate it. I imagine some will stand the test of time and scrutiny and others won't. The format chosen for presentation has ample precedent in earlier collections. All that said, there is always room for methodological reflection and refinement of what we are doing. And what we do with quotation fragments is, as Liv observes, complicated. But much of the complication consists of factors that scholars specializing in ancient texts have learned to take for granted. Like the Book of Noah fragment (if that is what it is), most of our manuscripts of ancient or early medieval works are medieval and we must try to reconstruct the ancient work as best we can, often on the basis of maddeningly corrupt manuscripts. The complications of interest here are with the additional inference that a passage in the Book of Asaph (as best we have it in a medieval manuscript) which claims to give us the Book of Noah is actually an excerpt from an ancient book with that title. Here it is not clear to me why Liv only allows that "other sources may point" in the direction "that there was an ancient conception of a work ascribed to Noah." This very cautious formulation seems to me to be a simple matter of fact. There are references to a book of Noah, not only in Jubilees 21:10 and 10:13, but also in Aramaic Levi 57 and in the Genesis Apocryphon v 29. There was a conception of a work ascribed to Noah. Whether in fact one or more such works actually existed is uncertain (I think it likely) and whether we can reconstruct part of it is more uncertain still. But I believe that Martha Himmelfarb has made a good case for the fragment in question to be a stratigraphically earlier version of material found in Jubilees. This material is connected both there and in the Book of Asaph with a book of Noah, so it may well be that that is where it came from. Liv asks about this book, "can we really get to it, and why is it an aim to get to it?" My answer to her first question is: Quite possibly, based on the specific case that Martha has made. Why is it an aim to get to it? Because our aim is to recover every surviving scrap of writing from antiquity. Bit by bit, a letter at a time, whatever it takes. Until we're done. I take it that Liv is not concerned so much with the question of whether any or all of the quotation fragments we have published actually come from ancient "works." A specific case has been made for each on its own terms and doubtless other specialists will find some cases more persuasive than others. Rather, she has broader methodological concerns about applying what she calls the "work-model" to these texts at all. Along these lines she asks some wide-ranging methodological questions. First she says "We need to ask ourselves about the extent to which it is fruitful for readers of MOTP to get acquainted with this material in the work-format, or whether this format hides too much information, or even creates a map of second temple Judaism and late antiquity that may not fit the territory." My main response to this is that we chose this format as the best and clearest way forward to present the material to both a specialist and a nonspecialist audience. Our concerns were practical and not just methodological. Second she asks, "[H]ow do we value the information contained in the source material when 'the ancient books' are what we aim for?" There are many different possible answers to this question. Her approach using New Philology values the manuscripts and texts in ways rather different from the ways we valued them, but both approaches have a significant contribution to make. She asks finally, "Does the Pseudepigraphon have to be a book, identifiable as a 'work,' in order to be something in its own right at all?" My answer: I don't know. I doubt it. In conclusions, once again, I want to convey the gratitude of the editors to this review panel for their warm welcome of the new volume, their praise, and their thoughtful critical comments. Regarding the question of terminology, I would like to sound a note of caution. The current discussion reminds me of the similar discussion of the term "magic" in the 1990s, in which specialists in the area expressed strong and quite justified reservations about the use of the term for what they were studying. Marvin Meyer offered a replacement term, "ritual power," and Jonathan Z. Smith argued that the term "magic" should be dropped in favor of more specific terms on a lower order of taxonomy, but by the early 2000s the discussion had died down without coming to any conclusion. This conversation was quite useful for helping specialists in magic understand better what they were studying, but ultimately the unsatisfactory term "magic" carried the day and it is the term used in the various SBL sessions in which the specialists carry on with the important work of understanding the ancient magical texts. It could happen again. I appreciate the many problems with the term "pseudepigrapha" and I don't dispute that the current discussion is helping us better to understand the texts on which we are working. At the same time, I see no sign of a groundswell of support for new terminology that can adequately replace the term "pseudepigrapha." I cannot predict the future, but I see no need to assume that the current discussion will succeed in producing such terminology, and it may well be that at a certain point we pseudepigraphers will join the magicians and just get on with studying the texts. There is a certain irony that we are being told in the Pseudepigrapha Section that "pseudepigrapha" is a term we should drop and that should not have been used in our volume. When we reach the point of consensus that the title of this unit should be changed to something else that most of us can agree on, not to mention the title of the Journal for the Study of the Pseudepigrapha, and the titles of both are in fact changed, I will be more worried about the word "pseudepigrapha" in our volumes. I suggested the Unobtainium Section and the Journal for the Study of Unobtainium, but no one seemed to want to go with that. Jesus & Brian - Or: What Have the Pythons Done for Us? Ever since Philip Davies first wrote on the film 15 years ago, other scholars too have turned their gaze to consider exactly what Life of Brian does in regard to Jesus scholarship, and have increasingly delved into its curious corners to reflect on what it says both about the tumultuous times of Jesus and also contemporary scholarly discussions. Biblical scholarship has moved on greatly in the past 25 years, and various aspects of Life of Brian correlate with themes now intensely explored. Every Bible scholar knows what ‘blessed are the cheese-makers’ means among us! This conference opens up Life of Brian to renewed investigation, using it in an innovative way to sharpen our view. Papers presented by some of the world’s most eminent biblical scholars and historians will discuss the film’s relevance to history, biblical studies and Life of Jesus research (see below). There will be discussion of the socio-political context and Josephus; costuming and setting; and other topics. The aim is to use the film to reflect on history, interpretation and meaning, as a tool that can help us consider our assumptions and the historical evidence: a ‘reception exegesis’ approach. There will be a book produced with selected conference papers, with a publication date of mid-2015. It is also a celebration of a British movie masterpiece. I am dumbfounded by what a good idea this is. Follow the link for registration information and an impressive list of speakers. SYRIAC WATCH: Bibliographical Handouts by Dr. Sebastian Brock (Dumbarton Oaks). UPDATE: Dead link now fixed. BACK IN ST. ANDREWS and in my office. Happy Thanksgiving to my American readers and all others celebrating. HAPPY HANUKKAH (CHANUKKAH) to all those celebrating. The festival begins this evening at sundown. Some background on Hanukkah is collected here, and some more recent Hanukkah-related posts are here, here, here, and here. HEADING BACK TO ST. ANDREWS. Should be there tomorrow (Wednesday) evening. Excellent conference. More later. Corrando Martone (ed. ), Lettere di Bar Kokhba. Brescia 2013. ASOR BLOG: Jewish Popular Piety in Late Antiquity (Michael L. Satlow). A report on his stint as Seymour Gitin Distinguished Professor at the Albright Institute. HANUKKAH | Modi’in struggles to preserve its ancient Maccabean history (judy lash balint, jns.org). Reconciling those two aspects of Modi’in is at the heart of a struggle playing itself out on local, national and international levels, as archeologists and preservationists try to raise awareness of Modi’in’s rich Hanukkah-related history and preserve ancient sites, while most city and government officials are focused on developing services for today’s residents. The specific site of ancient Modi'in remains debated among specialists, but Umm el-Umdan definitely has some important ancient architecture from the Maccabean era. The deadline for application is 1 February 2014. Follow the link for full application details etc. SETH SANDERS: A Guide to SBL Ghost Panels. A list of some information missing on the SBL app. As I noted yesterday, the Pseudepigrapha session on Monday afternoon has problems too. I'M IN BALTIMORE. More tomorrow. Art, History, and the Historiography of Judaism in Roman Antiquity explores the complex interplay between visual culture, texts, and their interpretations, arguing for an open-ended and self-aware approach to understanding Jewish culture from the first century CE through the rise of Islam. The essays assembled here range from the “thick description” of Josephus’s portrayal of Bezalel son of Uri as a Roman architect through the inscriptions of the Dura Europos synagogue, Jewish reflections on Caligula in color, the polychromy of the Jerusalem temple and new-old approaches to the zodiac, and to the Christian destruction of ancient synagogues. Taken together, these essays suggest a humane approach to the history of the Jews in an age of deep and long-lasting transitions—both in antiquity, and in our own time. I'M OFF TO BALTIMORE for the Annual Meeting of the Society of Biblical Literature. Note that both the online and the paper Program Books have some inaccuracies in this entry. They omit Professor Najman, give the respondents in the wrong order, and assign incorrect times to each presentation. Please go by the information given above. Also, Professor Lied provides a foretaste of her review here. If you are attending SBL this year, we hope to see you there. As usual, I will blog as much as time permits during the conference. Also as usual, I have pre-posted something for each day I'm away, so do keep visiting PaleoJudaica over the next week. As Sacred Scriptures for the believer, the Hebrew Bible, the New Testament, and the Qur'an inspire and guide billions of faithful women and men, young and old, across the globe. One of the exceptionally fruitful contexts in which the reception, interpretation, transmission of, and engagement with these holy texts flourished was in the Syriac-speaking milieu. The articles collected in this volume illuminate the critical contribution of Syriac studies to understanding important aspects of reading Jewish, Christian, and Islamic sacred texts in historical contexts. They open the reader's imagination to the contribution of the Syriac-speaking world for the cross-fertilization of these sacred texts and their interpretation. Grain can actually be eaten fresh, but only in early spring, when it’s still green and full of sugar. It can also be toasted, which is the way Ruth and Boaz enjoyed it on their first lunch date (Ruth 2:14: At mealtime Boaz said to her, Come over here. Have some bread and dip it in the wine vinegar. When she sat down with the harvesters, he offered her some roasted grain.) Turning it into bread was a lot harder. The earliest food processor in history was a grinding stone, the likes of which have been found in excavations going back many thousands of years. Scholars say that even though the baking itself took only a few minutes after plastering the raw dough on the inside walls of the oven, it probably took a woman about three hours to produce enough flour for a minimum-sized household of six. THIS WEEK'S DAF YOMI COLUMN BY ADAM KIRSH IN TABLET: The Talmud’s Yom Kippur, With Sacrifice and Blood, Is Nothing Like Jewish Ritual Today. The rabbinic tradition arose from the fact that the Bible doesn’t tell us what we need to know to lead our lives. But the Yom Kippur we read about in the Talmud is not exactly the Yom Kippur Jews experience today. For the last 2,000 years, the Day of Atonement has been observed with prayer and fasting. But in the days when the Temple stood, the heart of Yom Kippur was an elaborate daylong ritual performed by the high priest, the Kohen Gadol. This involved animal sacrifice, confession of sins, and the sprinkling of blood in the Holy of Holies, the innermost chamber of the Temple; and most of Tractate Yoma is consumed with getting the details of this ceremony exactly right. Unlike Eruvin, then, which is intensely practical in its focus on what ordinary Jews can and can’t do on Shabbat, Yoma is highly abstract. It is about a ceremony that hasn’t been performed for 2,000 years and that even then was performed by just one man out of the whole Jewish people. RISA LEVITT KOHN, co-curator of the Dead Sea Scrolls exhibition currently about to open in Utah, is interviewed by Brian Staker in the Salt Lake City Weekly: The Dead Sea Scrolls: The Leonardo's exhibition brings the time of biblical writing to life. There exists a strong scholarly consensus that polemic has played a central role in Jewish history. Whether we consider polemics involving Samaritans, Christians, Qaraites, Muslims, Haskalah thinkers, Zionists, “the nations,” or contemporary group identity formation, polemical forms of argumentation and representation have been widespread in thinking about Jews and Judaism. However, this scholarly consensus often obfuscates rather than clarifies, preventing the category of polemic from receiving careful scrutiny. The label “polemic” can render certain aspects of a text unproblematic or irrelevant, because scholars frequently view polemic as a dishonest form of argumentation that bears little or no relationship to a writer’s “real” views. To move this situation forward, scholars must begin to ask the following questions. How can scholars identify polemic and delimit its boundaries? Does the label polemic imply that a given author actually held different views? How is that view identified? Are there limits to polemic, either based on reasonableness or believability? Do consumers of polemic share the scholarly skepticism of polemic or recognize the rhetorical strategies at play? What role does relationship with a real or imagined “Other” play in constructing identity? This one-day graduate student conference at the University of Pennsylvania will focus on these and similar questions. It will feature Dr. Elisheva Carlebach as the keynote speaker and students of different periods and disciplines in the study of Judaism and Jewish history who will bring different data to bear on these theoretical questions. This one-day event will be held on Thursday, March 20, 2014. Proposals should be 500-800 words, and include a title, description of the specific materials studied and method, and a statement of thesis. Relevant papers might investigate specific texts, monuments, movements, people, or examples from material culture from any period of Jewish history, including contemporary research, with an eye toward the theoretical and methodological issues raised by problematizing the category of polemic. Papers may focus on any aspect of Jews and Judaism, from any perspective. We welcome submissions from graduate students both affiliated with and outside the University of Pennsylvania. Selected papers will receive small travel stipends. Please submit proposals to warringwords2014@gmail.com by January 6, 2014. Talmud-Era Jewish Community at Elad?